Since food is necessary for survival, these 5 Foods That Stretch Your Grocery Budget Farther are important for every family to consider. Unless you are independently wealthy, you are likely frustrated at the amount of money you spend just to eat. These tips are going to revitalize your grocery budget in ways that will save you money, all while giving your family healthy and delicious foods to eat. Have you ever tried dry beans? 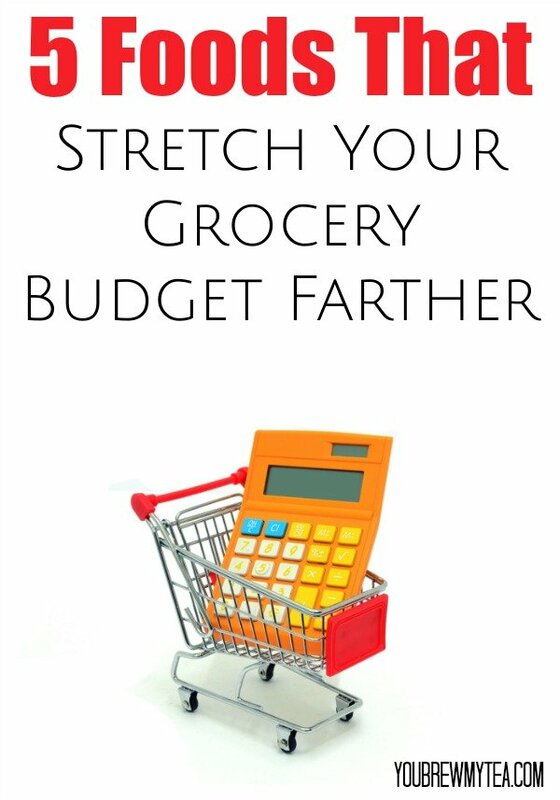 While they’re not the first “thing” you think about putting on the table for dinner, they can be a lifesaver when it comes to stretching your grocery budget. In fact, a little know fact is that the always popular Crockpot was actually created to help cook beans without as much constant tending. We use beans in soups,tacos, taco salad, burritos, casseroles and by themselves. Rice is a yummy side dish or main dish and there’s so much you can do with it. You can make anything from chicken and rice to your favorite Chinese meal. Rice can taste yummy plain or with seasoning on top. Add a little bit of cheese and seasoning to your rice and you will be in heaven! In most areas of the country, you can pick up a sack of potatoes fairly cheap. It amazes me what you can do with potatoes to create a filling meal. If you have a home garden, growing and storing your own is super easy. There is so much you can do with flour in the home. It’s fairly inexpensive and you can make lots of staples from it. We make our own bread, hot rolls, cakes and bread sticks for much less than ready made! Yes! Eggs are so cheap and they can go so far. Whether you’re making eggs for breakfast or for a quick meal, they are the ultimate food to help stretch your budget. Here are some meal ideas for eggs. These foods that stretch your grocery budget farther are staples in our home. Not only can we make sure we are feeding our family within our budget, making real food from scratch is so much healthier for everyone. These items also help us to limit the number of chemicals and preservatives in our meals. Don’t forget about bananas. Add a bit of peanut butter for a great snack. Or blend with yogurt and berries that are about to go bad for a delicious smoothie. Freeze them and eat with chocolate for a dessert. Definitely a big one in our house as well! We eat so many bananas it is crazy! They are of course a favorite fruit! I also like stocking up when Mango, watermelon and cantaloupe are on sale and prepping it in baggies in the freezer for easy snacks. Thanks for this article- these are great ideas and I love that they are all nutritious foods too! I am working on cutting down my grocery budget and this will definitely come in handy! We really try to focus on nutrient dense foods as much as possible! Thanks for stopping by! Just saw this, and was curious to see your list—Yep, that’s what I have discovered too over the years as a 1income family of 7!? Keep up the good job of encouraging and educating! Are you just feeding a single person on that budget? If so, most of what we included in our post would be a great base. I would recommend some seasonings like a taco seasoning, garlic, onion powder, salt, and pepper additionally. Then some frozen veggies and fruit. If you have a local grocery store that does a “Pick 5 for $20” meat sale, that would be ideal for you. It would give you easily 15-16 servings of meat for $20. And, depending on what type of meats you chose, you could stretch that to 20 servings. Having a lot of dry beans on hand, peanut butter, and rice can stretch out the rest of your month. Family of 6 – all adults, 1 pregnant. I struggle with multiple family food allergies and what some will eat. Youngest (24) Can’t have Dairy or Soy. I can’t do: Gluten, Peanuts, Soy, Potatoes (sweet potatoes are okay), Corn syrup or corn starch. 1 son & hubby will only eat beans in chili or baked beans, My Daughter-in-law(expecting) & I are the only ones that will eat them otherwise. I make lots of homemade rolls, bread, and pizza dough though I can’t eat it. I am still experimenting with gluten free baking things. Gluten free stuff is expensive to buy. We go thru about 15 pounds of Rice a month. I do mostly cook from scratch due to the food allergies but still end up making 2 or 3 different dinner meals.So many nights it is just too much effort. Getting adult kids taking turns cooking is coming along. Still struggling with variety and what they are comfortable making (they are all on the Autism Spectrum). I have found one way with Soup…we have it like a “Salad Bar”. I cook the meat down for scratch broth and meat, then everyone adds what they want into their soup mug. Half prefer Rice, the other Egg Noodles. I love adding lots of veggies (maybe leftover from other meals), most just like corn in theirs.